Hi, my name is David Klein, and I want to personally welcome you to the Blogger’s Handbook. When I first started blogging I knew nothing about blogging and had no connections in the blogging world. I made countless mistakes, wasted thousands of dollars, and almost quit three times. Today, almost a decade after I started my first blog, I've created blogs that got over 400,000 hits per month, earned a Google PageRank of 4, a website grade of 99/ 100, have been linked to by some of the biggest sites around – Gizmodo, The Toronto Star, Business Insider, and CoedMagazine to name a few, had the opportunity to interview celebrities, test and review cars and gadgets before they were released to the public, but most importantly, it has given me a job that I absolutely love to go to each and every day. The Blogger’s Handbook took close to a year to write, and it is the product of years of trial and error, so that you don’t have to make the same mistakes that I have. I know how hard it can be to start something new and feel as if you have no one to talk to or answer your questions and that’s why The Blogger’s Handbook has been created for you and everyone else who wants to either start a new blog but doesn’t really know how or for those who already have a blog up and running but are frustrated with the lack of traffic/money to their blog. This book has been designed in mind for everyone from the person I was a decade ago with zero knowledge of blogging to the more experienced blogger who is simply looking for some extra tips to bring his/her blog to the next level. The Blogger’s Handbook covers everything from basic stuff (like how to set up WordPress in your c-panel) to more advanced stuff (like setting up clickable background skins on your blog to how to change your Twitter and YouTube page backgrounds). Also, most of the tips and tricks in this book are 100% FREE to use. I share with you the one site that gives my blog tens of thousands of new hits every month (and the best part about this site is that it will only take a couple of extra minutes out of your day). I’ll explain to you the different social networking sites you should be using on a daily basis and show you how to automate the whole social networking process so that you don’t have to waste a second of your time uploading your links to the different sites. It’s all done for you the second you update your blog. - If you need any bit of help, just ask. I'm sure we could help you. 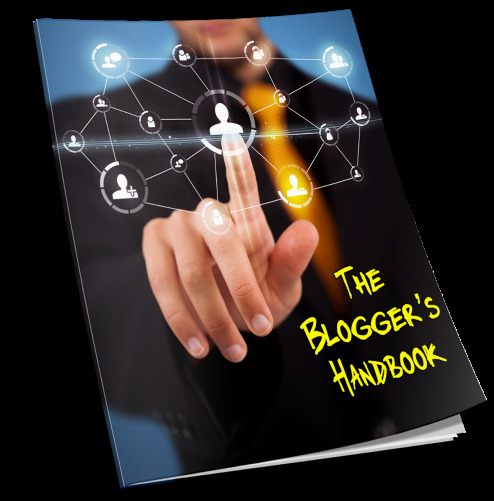 PREVIEW the first 15 pages of The Blogger's Handbook before you purchase the book. If you do not think this book is worth at least $5, I will return your money NO QUESTIONS ASKED.